Last June, we went to southern California, turning Martha's business trip in San Diego into a brief family vacation. We took advantage of proximity to visit Disneyland; it was fun in its own right, although we found ourselves comparing and contrasting what we had seen in Disney World. This split-screen video from Disney Parks' YouTube channel shows precisely how specific things vary. 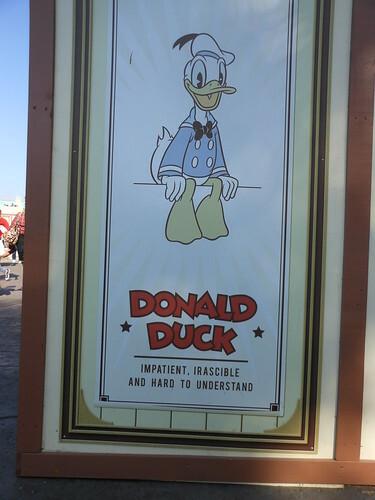 There are plenty of little quirks and features in Disneyland, which we observed during our trip there in June. Some of them are in this set of tiny bronze statues, which form a circle around a much more famous statue called Partners, of Walt Disney and Mickey Mouse. I was impressed by just how much detail there was. 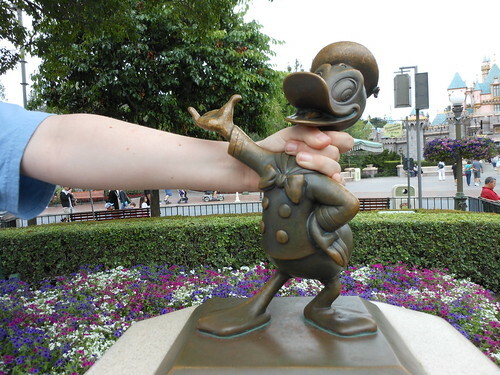 Click through for Nick playing around with Donald Duck! 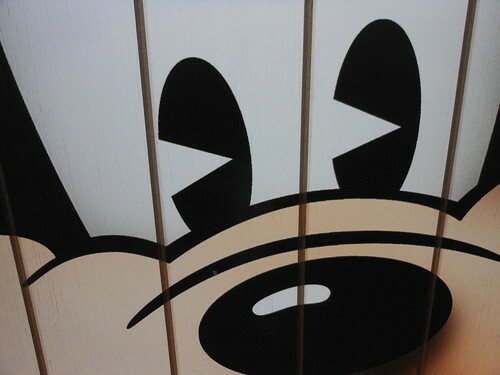 This is a detail from a billboard covering a renovation underway at the California Adventure park in Disneyland, in California. Nick and I noticed that the stylized eyes drawn on Mickey in the retro-themed versions bore a strong similarity to Pac-Man. 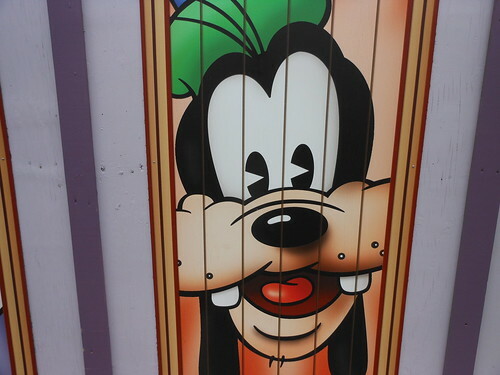 Here's a similar poster about Goofy ... with the same kind of eyes. 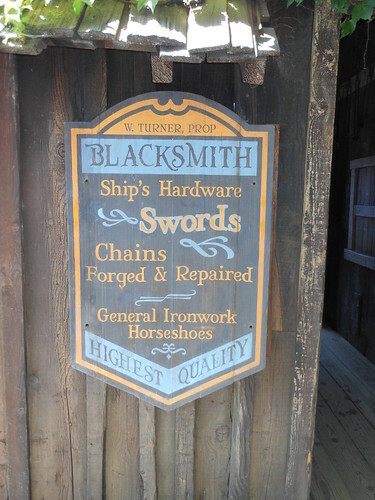 I snapped this picture on Tom Sawyer's island, in Disneyland, which has been given a pirate-y makeover to kids who I'm quite sure have no idea who Tom Sawyer is, but certainly know all about pirates. At least, that is, how pirates are presented in the movies. I didn't notice until I got home that the name on the sign is W. Turner, pretty much like Orlando Bloom's character, Will. Another shot from our visit to Disneyland a few weeks back. 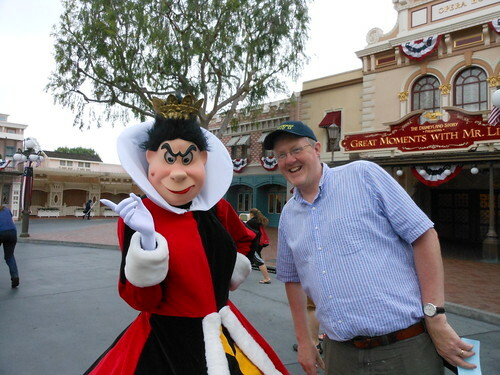 The Queen of Hearts from Disney's Alice's Adventures in Wonderful may not be the visitor draw that, say, Goofy or Mickey Mouse are, but I didn't miss a chance to run over so Martha could take a quick snap. But still, she's not the kind of woman you mess with too much! What happens when an 11-year-old makes a suggestion ... and Dad goes along with it. 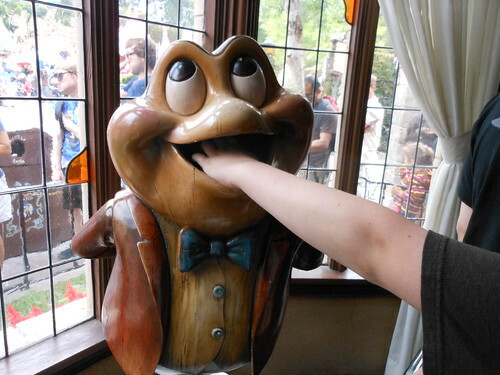 Nick could not resist playing fly as he passed Mr. Toad at the ride in his name at Disneyland. It turned out to be one of my favourite photos from the vacation. 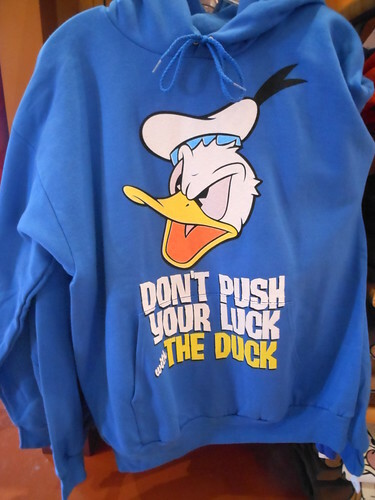 I spotted these shirts at a Disneyland shop that definitely aims for the younger, jaded set ... somewhere between pie-eyed kids and sentimental grown-ups. This is one of the panels covering up a renovation area at Disneyland. It made me chuckle. When you go to a Disney park, you're going to find a lot of food. (Some of it's quite, quite good, too, but that's another story.) Disney presents its own sweets, and takes advantage of its pantheon of animated stars to appeal to your tastebuds. Here are some of the packages I saw. Seen those kids with the enormous headphones? They may only be playing an iPod, but the headphones are studio-quality, I'm sure, and often as big as their heads; last week, I saw one young fellow with an elongated cord that - no lie - dropped to the floor and back, with room to spar. 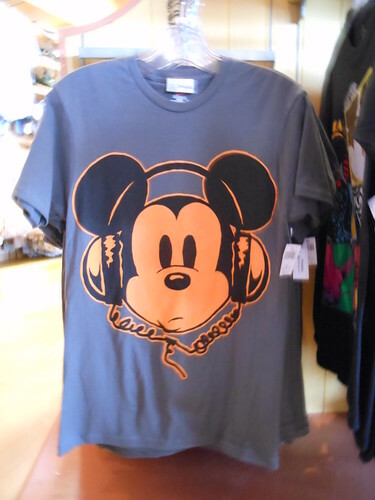 I spotted this shirt at one of the shops in Disneyland. 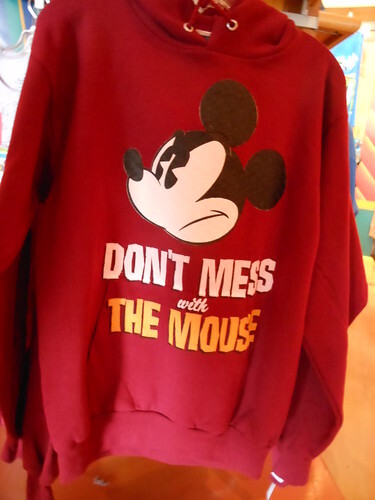 It made me chuckle ... and reminded me that while Mickey Mouse is more than 80 years old, Disney is always, always trying to keep him au courant. 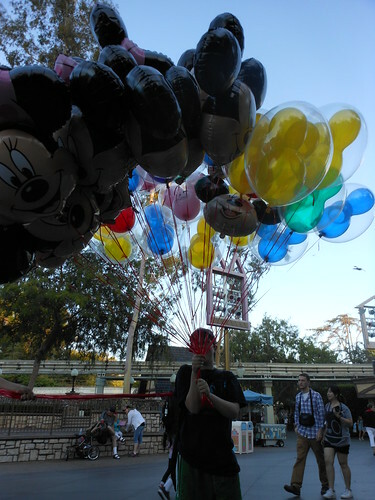 During our trip to southern California this month, we darted up to Disneyland for a few days, and had a great time. Our family has twice been to the much larger and more complex Disney World resort in Florida, and we enjoyed this one just as much. I'll have a few pictures and notes to share in the days ahead. 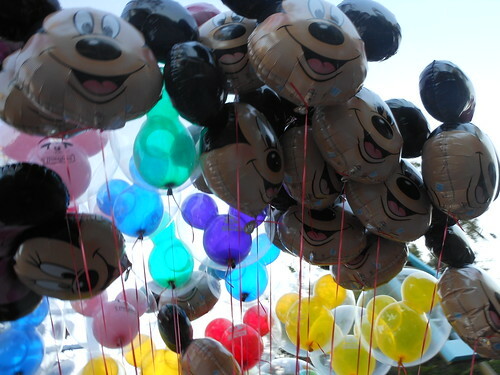 I snapped this shot of Mickey Mouse balloons; Disney has perfected the art of surrounding its customers with shiny, attractive objects, many of which just happen to be for sale! The balloons appear to be popular sellers, judging from the toddlers (and more often their parents) who could be seen leaving the park with one in tow. The young woman who was toting the balloons then pulled them down and passed them to Nick, who couldn't resist the opportunity to hold them all ... although he seemed to be wanting to be sure he would not float away with them!